Cortical developmental malformations are best diagnosed by MRI and are often the cause of refractory epilepsy. Little is known about the metabolic cell function on MR spectroscopy of these types of brain anomaly. We studied 23 patients with cortical developmental malformations and refractory epilepsy using proton MR spectroscopic imaging. Mean age was 28 years (range, 9 to 47 years). The lesions examined were focal cortical dysplasia (n = 5), heterotopia (four band, six periventricular, two subcortical), polymicrogyria(n = 3), tuberous sclerosis (n = 2), and polymicrogyria and periventricular nodular heterotopia (n = 1). We measured the relative signal intensity of N-acetylaspartate/creatine (NAA/Cr) in the lesion, in the perilesional region, and in the region remote from the visible lesion. The values were compared with those from similar brain regions of 25 normal control subjects. The mean NAA/Cr z score values for the 23 patients were as follows: lesion, -2.20 ± 0.32 (mean ± SE), n = 21; perilesional region, -1.01 ± 0.38, n = 15; and distant region, -0.03 ± 0.34, n = 18 (p < 0.0002). Despite the presence of a large number of neurons, heterotopia showed a relative decrease of NAA in some patients, suggesting that the neurons present were dysfunctional. The maximal NAA/Cr decrease, indicating metabolic dysfunction, colocalized to the structural malformation as defined by MRI and extended to normal-appearing regions adjacent to the visible lesion. Brain development is a complex process regulated by many factors. After neural induction, neuroblasts proliferate and differentiate into neural or glial cells. From the germinal plate, neuroblasts migrate to their final destination. Once the individual cells have established their identities, they extend their axons and establish synaptic connections. Disruption at any of these critical periods of formation of the nervous system leads to different types of cortical developmental malformations (CDM). These may be gross abnormality such as lissencephaly or microscopic and invisible on conventional MRI. The appearance of the abnormal cells also varies depending on the timing of the insult. MR spectroscopy of brain enables noninvasive quantification of metabolites in vivo. The most intense signal in the proton MR spectrum of brain originates from the N-acetyl groups, mainly N-acetylaspartate (NAA). Less intense signals arise from creatine plus phosphocreatine (Cr) and choline-containing compounds (Cho). NAA is localized exclusively in neurons and neuronal processes in the mature brain9-11 and can be used as a neuronal marker.11,12 Decreased NAA is observed in areas of neuronal loss or dysfunction.11-13 Cr, which may be more concentrated in glia than neurons,11 is relatively homogeneously distributed in normal brain and can be used as an internal standard in this circumstance. This study was designed to assess whether proton magnetic resonance spectroscopic imaging (MRSI) measurements of NAA could detect abnormalities associated with neuronal lesion in CDMs, whether the abnormalities extent outside the lesion visible on MRI, and whether different types of CDM exhibit different abnormalities in the proton spectrum. Methods. We studied 23 patients (10 females and 13 males) with different types of CDM. All 23 patients had medically refractory epilepsy. The mean age at study was 28 years (range, 9 to 47 years). Diagnostic MRIs were acquired using a 1.5-T combined imaging and spectroscopy system (ACS III Philips Medical Systems, Best, The Netherlands). We acquired sagittal and coronal T1-weighted (TR 550, TE 19 ms) images, followed by transverse proton density (TR 2000, TE 20 ms) and T2-weighted (TR 2100, TE 20, 78 ms) images. T1-weighted gradient-echo volume acquisition of the whole brain (TR 18 ms, TE 10ms, 30° angle, 1-mm-thick contiguous slice) was acquired for multiplanar reconstruction. Proton MRSI studies were performed in a separate examination. After scout images in axial and sagittal planes, a multislice transverse spin-echo MRI(TR 2000, TE 30) was obtained. A large volume of interest (VOI), including the lesion, was defined for selective excitation. A water-suppressed proton MRSI was acquired from the VOI (TR 2,000 ms, TE 272 ms, 250 × 250 mm field of view [FOV], 32 × 32 phase-encoding steps), followed by a proton MRSI without water suppression (TR 850 ms, TE 272 ms, 250 × 250 mm FOV, 16 × 16 phase-encoding steps). Postprocessing included zero-filling the water-unsuppressed MRSI to obtain 32 × 32 profiles, followed by application of a mild Gaussian k-space filter and an inverse two-dimensional Fourier transformation to both water-suppressed and-unsuppressed MRSI.14,15 Residual water signal was removed by applying the linear Hankel singular-valve decomposition (HSVD) fitting method.14 Resonance intensities in individual spectra were determined by integration of peak areas using locally developed software. The definition of the region (figure 1, A and B) corresponding to lesion, perilesional tissue, and tissue remote from the lesion were based on MRI and performed by one of us (A.C.B. ), who was unaware of the MRSI results. The perilesional region was defined as normal-appearing tissue surrounding MRI-visible lesions. Remote regions within the VOI were defined as more than 2 voxels (approximately 2 cm), at least, away from the MRI-visible lesion and appearing normal on MRI. Values for NAA, Cho, and Cr were determined by averaging values from spectra in these three regions. Figure 1. A 22-year-old man with seizures since age 5 years. (A) Scout MRI showing the VOI with superimposed phase-encoding grid and the three regions of interest; lesion, perilesion, and remote from the lesion. (B) Axial T1-weighted image showing left parietal focal cortical dysplasia (arrow). (C) Average spectra from the three regions of interest. The reduction in NAA signal intensity is greatest in the lesion and decreases with distance from the lesion. The size of the VOI for spectroscopy was 75 to 100 mm in the left-right axis, 75 to 105 mm in the anteroposterior axis, and 18 to 20 mm in thickness. The size of the individual voxel after postprocessing was approximately 1.2× 1.2 × 1.8 to 2 cm (thickness of the box). The number of voxels averaged for each of the three regions (lesion, perilesion, and distant from the lesion) ranged from 2 to 15.
z Scores (standardized scores that express the original raw values in terms of SD from the mean of the normal control group) were used because they allowed uniform comparison of the degree of reduction of NAA/Cr values in the lesion, the perilesional region, and regions remote from the lesion. 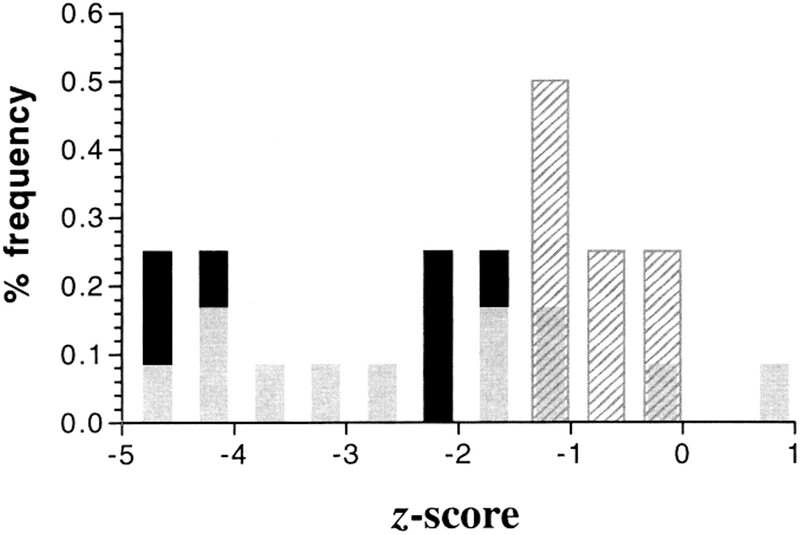 z Scores were obtained for each individual patient by subtracting NAA/Cr values from the mean NAA/Cr value obtained from a similar region of a group of 25 age-matched normal control subjects and dividing the result by the normal control subjects' SD for that region. ANOVA was performed to assess statistical differences among the z scores of NAA/Cr ratio from these three regions (lesion, perilesion, and remote from the lesion). In six patients with unilateral lesion, we also assessed the percentage differences of NAA, Cr, and Cho between the lesion and contralateral homologous regions. The objectives of this study were explained to all patients and informed consent was obtained. Results. The CDM studied were focal cortical dysplasia in 5 patients, heterotopia in 12 (4 band, 6 bilateral periventricular, 2 unilateral subcortical), bilateral perisylvian polymicrogyria in 3, tuberous sclerosis in 2, and unilateral perisylvian polymicrogyria plus bilateral periventricular nodular heterotopia in 1. Seventeen of 23 patients had bilateral structural abnormalities. We obtained spectroscopic information from the three regions (lesion, perilesion, and remote regions) in 12 patients, from at least two of these regions in 7 patients, and from only one region in 4 patients(table). Remote from the lesion = -0.03 ± 0.34 (n = 18). There was significant difference among these regions with p< 0.0002 (ANOVA) (see table). Remote from the lesion = -0.71 ± 0.52 (n = 4). There was significant difference among these three regions with p < 0.02 (ANOVA). Remote from the lesion = 0.56 ± 0.41 (n = 4). There was no significant difference among these three regions with p > 0.09 (ANOVA). Remote from the lesion = 0.08 ± 0.57 (n = 8). In unilateral CDM, comparison between ratios of NAA in the lesion/NAA in contralateral homologous region and the mean control subjects' NAA ipsilateral to patients' lesion side/mean control subjects' NAA in the contralateral hemisphere showed relative reduction of NAA resonance intensity of 5 to 51% (mean ± SD, -21 ± 16%; median, -11%) in the lesion. We used the same method of comparison for Cr and Cho. Cr showed a mean reduction of 1% (median, -3%; SD, 25; range, -37% to 27%). Cho showed a mean increase of 12% (median, 6%; SD, 51; range, -49 to 100%). In the 23 patients, the interictal EEG abnormalities were localized in 6, regional in 7, multifocal or generalized in 8, and silent in 2. We observed very active interictal EEG activity, characterized by frequent runs of polyspikes, in 10 patients (see table, Patients 1, 2, 3, 4, 6, 8, 9, 16, 17, and 20). There was no relationship between the extent and degree of active interictal spiking and NAA/Cr ratio values. Discussion. We found relatively decreased NAA/Cr signal intensity in some types of CDM suggesting abnormal neuronal metabolism in these malformations. The relative decreased NAA signal intensity, when present, was maximal in the lesion, decayed in areas surrounding it, and was less marked or absent in areas far from the lesion (seefigure 1C). Possible explanations for the low NAA outside the visible lesion include microscopic abnormalities that extend outside the lesion visible on MRI, depression of NAA by epileptic activity, or altered relaxation time of NAA or Cr. The presence of microscopic abnormalities more extensive than the lesion visible on MRI would be consistent with pathological16,17 and clinical3,7,8,18 observations and could explain, at least in part, the poor surgical results sometimes observed in patients with CDM. Palmini et al.19 found that active residual repetitive cortical spiking had negative influence on surgical outcome and suggested that additional resection of the spiking cortex surrounding CDMs should be performed, speculating that this type of epileptiform activity reflects underlying microscopic cortical malformation. Ongoing interictal epileptic abnormality or recurrent seizures could lead to secondary neuronal dysfunction through secondary involvement of areas connected to the primary epileptogenic region.20-22 This is consistent with our recent observation that NAA in the remaining temporal lobes increases after successful anterior temporal lobectomy.23 We do not believe that altered relaxation times are responsible for the altered NAA/Cr, because the nature of the pathology would not be expected to produce changes in relaxation times, especially changes that would affect NAA and Cr sufficiently differently to alter their ratio significantly. We did not perform absolute quantification of metabolite signal intensities but rather used Cr as an internal standard to normalize intensities between subjects. In patients who had unilateral lesion visible on MRI, we compared the metabolites to the homologous normal-appearing region of the contralateral hemisphere. In these patients, Cr in the lesion was similar to Cr in the contralateral homologous normal-appearing region (mean difference, -1%, maximum increase of 27%). Thus, increases in Cr cannot explain the magnitude of the observed decreases in NAA/Cr that must, therefore, represent NAA decrease. Distinct developmental malformations result from insults occurring at different stages of cell generation, proliferation, differentiation, and migration into the cerebral cortex.24 We demonstrate that different types of CDM may also show different degrees of relative NAA decrease (figure 2). For instance, in focal cortical dysplasia, we found very low NAA/Cr ratios. This disorder results from abnormal neuronal and glial cell differentiation and proliferation, and the lesion contains structurally abnormal neurons and, at times, balloon cells. Both are probably dysfunctional cells with abnormal synaptic activity and connectivity, and presumably this explains the reduced NAA/Cr values. In polymicrogyria, the malformation is due to abnormal cortical organization. The timing of the insult is postmigrational, and neurons are thought to be mature. More normal cellular structure and the presence of synaptic integrity may explain why patients with polymicrogyria have normal NAA/Cr ratios (seefigure 2). Figure 2. Frequency distribution of NAA/Cr z scores for different types of CDM. Seventy-five percent of patients with focal cortical dysplasia had NAA/Cr more than 2 SD below the normal mean. All cases of polymicrogyria had NAA/Cr within the normal range. Heterotopia were variable with half of the patients having NAA/Cr more than 2 SD below the normal mean. Black bars indicate FCD; shaded bars indicate heterotopia; and hatched bars indicate PMG. Figure 3. A 16-year-old boy with seizures. (A) MRI showing a large unilateral heterotopia. The black rectangle shows the VOI for MRSI. (B) The corresponding NAA image shows a relatively low signal intensity from NAA over the heterotopia compared with the contralateral normal side. The degree of interictal EEG activity, and the extent of the EEG abnormalities (localized or generalized), did not correlate with the NAA/Cr values in our series. Kuzniecky et al.30 also failed to find correlation between relative NAA/Cr values and EEG abnormalities in their series. The differences in NAA/Cr between types of CDMs appear to reflect more the type of malformation than the amount of interictal EEG abnormality. This suggests that the decrease in NAA is not entirely secondary to interictal epileptic activity. However, in this series, all patients had clinically refractory epilepsy, and further studies in patients with CDMs and well-controlled epilepsy might provide some answer about the relationship between the seizure severity and NAA signal intensity. There is as yet no consensus on the classification of malformations of the cerebral cortex; this is due to our incomplete understanding of the mechanisms underlying the pathophysiology of CDM.2 Proton MR spectroscopy may be useful in studying the biology of CDMs and, as with brain tumors,31 help to refine the classification and differential diagnosis in different types of brain lesions. Three of 24 patients in this study underwent surgical resections. This number is too small to make any meaningful clinicopathologic correlation. Multimodal image coregistration techniques32,33 that allow visualization of the relationship between structural lesions and cellular metabolism (PET, MRSI) or function (fMRI, EEG) may offer new dimensions for surgical planning and resection of malformations in patients with refractory lesional epilepsy. Supported by a grant from the MRC Canada. Dr. Li is recipient of a fellowship from the Savoy Foundation for Research in Epilepsy of Canada. Received May 19, 1997. Accepted in final form September 9, 1997. Barkovich AJ, Kuzniecky RI. Neuroimaging of focal malformations of cortical development. J Clin Neurophysiol 1996;13:481-494. Barkovich AJ, Kuzniecky RI, Dobyns WB, Jackson GD, Becker LE, Evrard P. A classification scheme for malformations of cortical development. Neuropediatrics 1996;27:59-63. Raymond AA, Fish DR, Sisodiya SM, Alsanjari N, Stevens JM, Shorvon SD. Abnormalities of gyration, heterotopias, tuberous sclerosis, focal cortical dysplasia, microdysgenesis, dysembrioplastic neuroepithelial tumour and dysgenesis of the archicortex in epilepsy. Clinical, EEG and neuroimaging features in 100 adult patients. Brain 1995;118:629-660. Li LM, Fish DR, Sisodiya SM, Shorvon SD, Alsanjari N, Stevens JM. High resolution magnetic resonance imaging in adults with partial or secondary generalised epilepsy attending a tertiary referral unit. J Neurol Neurosurg Psychiatry 1995;59:59:384-387. Palmini A, Andermann F, Olivier A, et al. Focal neuronal migration disorders and intractable partial epilepsy: a study of 30 patients. Ann Neurol 1991;30:741-749. Dubeau F, Tampieri D, Lee N, et al. Periventricular and subcortical nodular heterotopia. A study of 33 patients. Brain 1995;118:1273-1287. Sisodiya SM, Free SL, Stevens JM, Fish DR, Shorvon SD. Widespread cerebral structural changes in patients with cortical dysgenesis and epilepsy. Brain 1995;118:1039-1050. Sisodiya SM, Moran N, Free SL, et al. Correlation of widespread preoperative magnetic resonance imaging changes with unsuccessful surgery for hippocampal sclerosis. Ann Neurol 1997;41:490-496. Simmons ML, Frondoza CG, Coyle JT. Immunocytochemical localization of N-acetyl-aspartate with monoclonal antibodies. Neuroscience 1991;45:37-45. Moffett JA, Namboodiri MAA, Cangro CB, Neale JH. Immunohistochemical localization of N-acetylaspartate in rat brain. NeuroReport 1991;2:131-134. Petroff OAC, Pleban LA, Spencer DD. Symbiosis between in vivo and in vitro NMR spectroscopy: the creatine, N-acetylaspartate, glutamate, and gaba content of the epileptic human brain. Magnetic Resonance Imaging 1995;13:1197-1211. Gadian DG. N-acetylaspartate and epilepsy. Magnetic Resonance Imaging 1995;13:1193-1195. Cendes F, Andermann F, Preul M, Arnold DL. Lateralization of temporal lobe epilepsy based on regional metabolic abnormalities in proton magnetic resonance spectroscopic images. Ann Neurol 1994;35:211-216.
de Beer R, van den Boogaart A, van Ormondt D, et al. Application of time-domain fitting in the quantification of in vivo 1H spectroscopic imaging data sets. NMR Biomed 1992;5:171-178. Cendes F, Stanley JA, Dubeau F, Andermann F, Arnold DL. Proton magnetic resonance spectroscopic imaging for discrimination of absence and complex partial seizures. Ann Neurol 1997;41:74-81. Meencke HJ. The density of dystopic neurons in the white matter of the gyrus frontalis inferior in epilepsies. J Neurol 1983;230:171-181. Li LM, Dubeau F, Andermann F, et al. Periventricular nodular heterotopia and intractable temporal lobe epilepsy: poor outcome after temporal lobe resection. Ann Neurol 1997;41:662-668. Palmini A, Gambardella A, Andermann F, et al. Intrinsic epileptogenecity of human dysplastic cortex as suggested by corticography and surgical results. Ann Neurol 1995;37:476-487. Morrell F. Secondary epileptogenic lesions. Epilepsia 1959;1:538-560. Wilder BJ, King RL, Schmidt RP. Comparative study of secondary epileptogenesis. Epilepsia 1968;9:275-289. Racine R. Kindling: the first decade. Neurosurgery 1978;3:234-252. Cendes F, Andermann F, Dubeau F, Matthews PM, Arnold DL. Normalization of neuronal metabolic dysfunction after surgery for temporal lobe epilepsy. Neurology 1997;49:1525-1533. Sarnat HB. Cerebral dysgenesis: embriology and clinical expression. New York: Oxford University Press, 1992. Battaglia G, Arcelli P, Granata T, et al. Neuronal migration disorders and epilepsy: a morphological analysis of three surgically treated patients. Epilepsy Res 1996;26:49-58. Lee N, Radtke R, Gray L, et al. Neuronal migration disorders: positron emission tomography correlations. Ann Neurol 1994;35:290-297. Marsh L, Lim KO, Sullivan EV, Lane B, Spielman D. Proton magnetic resonance spectroscopy of a gray matter heterotopia. Neurology 1996;47:1571-1574. Preul MC, Leblanc R, Cendes F, et al. Function and organization in dysgenic cortex. J Neurosurg 1997;87:113-121. Kreis R, Ernst T, Ross BD. Development of the human brain: in vivo quantification of metabolite and water content with proton magnetic resonance spectroscopy. Magn Reson Med 1993;30:424-437. Kuzniecky R, Hetherington H, Pan J, Hugg J, Gilliam F, Faught E. Identification of metabolic abnormalities by proton MRSI in patients with malformations of cortical development. Epilepsia 1996;37(suppl 5):194. Abstract. Preul M, Caramanos Z, Collins D, et al. Accurate noninvasive diagnosis of human brain tumors by using proton magnetic resonance spectroscopy. Nature Med 1996;2:323-325. Peters T, Davey B, Munger P, Comeau R, Evans A, Olivier A. Three-dimensional multimodal image-guidance for neurosurgery. IEEE Trans Med Imag 1996;15:121-128. Preul MC, Leblanc R, Caramanos Z, Kasrai R, Narayanan S, Arnold DL. Magnetic resonance spectroscopy guided brain tumor resection: differentiation between recurrent glioma and radiation change. Can J Neurol Sci 1998;25:13-22.